Rodeo Roper, one of the most often booked attractions for Western themed events. 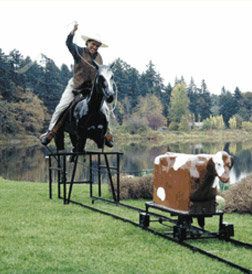 Hop onto our life-sized horse and attempt to lasso the calf as it heads down the track. You and your friends will have hours of fun competing who can lasso the most calves.